Over half of brands (55.5%) do not not have an effective strategy in place to deal with negative comments on social networks, according to a recent report from Social Media Marketing University (SMMU). Some 24.5% of brands are in the process of developing a strategy for dealing with negative comments, 7.6% have strategies in place that are proving to be ineffective, and 23.4% do not have a strategy in place and do not have plans to develop one, the study found. The report was based on data from a survey of 1,036 marketers, social media strategists, C-Level executives, and entrepreneurs. 26.1% of respondents say their brand’s reputation has been tarnished as a result of negative social media posts, 15.2% have lost customers, and 11.4% have lost revenue. 58.2% of brands receive customer complaints via social media occasionally, 10.9% receive them somewhat often, and 4.9% receive them very often. 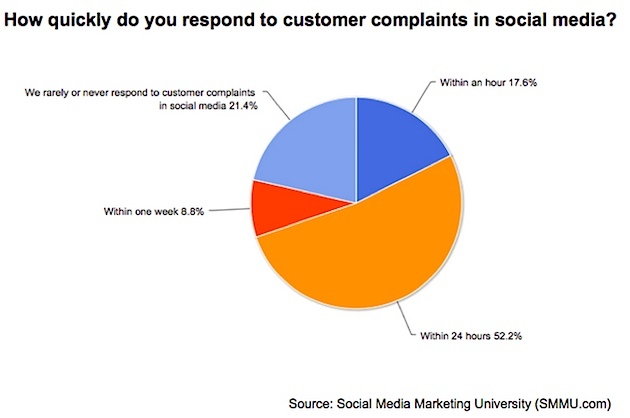 Only 17.6% of brands strive to respond to customer complaints on social media within an hour. Most (52.2%) respond within 24 hours, and 21.4% percent rarely or never respond. About the research: The report was based on data from a survey of 1,036 marketers, social media strategists, C-Level executives, and entrepreneurs conducted February 10-13, 2014. What? You’ve opened up that thing called “Outlook Express,” and you’re writing an email? Surely you know that this form of marketing and communications is as pass? as floppy disks and cell phones the size of Shaquille O’Neal’s shoe. Or is it? Now comes a McKinsey & Co. survey stating that email is a far more effective way to acquire customers than all that tweeting and posting and “liking” you’re doing on social media–nearly 40 times more than Facebook and Twitter combined. Depending on your perspective, McKinsey’s report may be earthshaking or simply what you’ve been telling everybody for years. Since the dawn of the social media age, back when wooly mammoths roamed the plains and fur-clad hunter/gatherers crouched around the campfire tweeting selfies, contrarians have touted the necessity of email. Ancient seer Jeremiah Owyang argued in 2009 that email was “the first–and largest–social network.” And cave scratchings in the form of a HostPapa infographic indicate that the bloody clash between email and social media was a matter of discussion way back in 2012. More recently, Hospitality Net in December awarded three of a five-round match to email in an article titled “Email vs. Social Media–Which One Deserves Your Marketing Dollar? “While there is a lot of hype around social media when it comes to usage, email wins hands down,” author Madigan Pratt asserts in a piece for the hotel industry. Tough luck for those smartphone users can’t be bothered to sit at a computer, right? They irritate everybody playing Annoying Orange’s Splatter Up during memorial services and symphony performances, anyway. Who needs them? Well, shrug them off at your own risk, McKinsey says. Sounds like its time not only to rethink your social media vs. email practices, but to your mobile strategy and landing pages as well.